Soprano Deborah Selig’s voice has been described by the press as “radiant,” “beautifully rich,” “capable of any emotional nuance,” and “impressively nimble.” Recent operatic highlights include Micaela in Carmen with Dayton Opera, Pamina in The Magic Flute with Boston Lyric Opera, Musetta in La Boheme with Central City Opera, Rose in Street Scene with Chautauqua Opera, and Donna Elvira in Don Giovanni with Kentucky Opera. This season includes Regina Isabella in Donizetti’s L’assedio di Calais with Odyssey Opera. 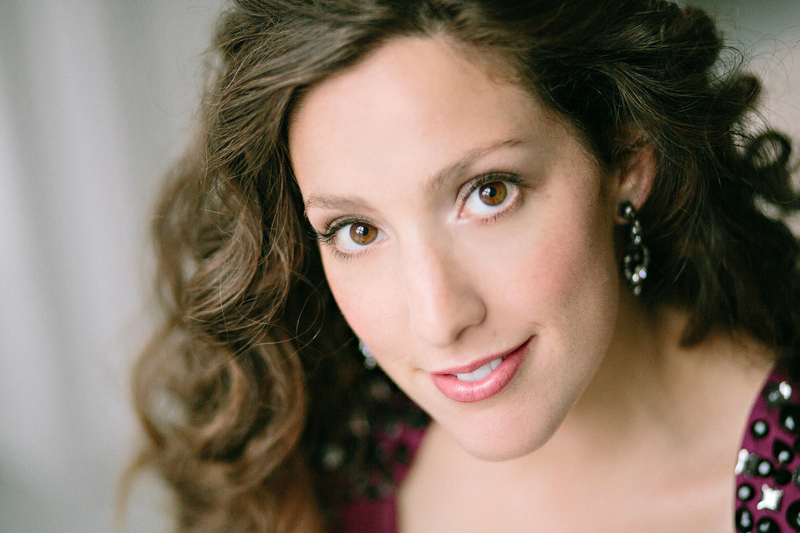 A striking and versatile artist on the concert stage, Ms. Selig has performed many song recitals and soloed with orchestras across the United States. Highlights include Mahler’s Symphony No. 4 with Asheville Symphony, Brahms’ Requiem with Dayton Philharmonic, Bach Cantatas 37, 92 and 97 with Handel and Haydn Society, Orff’s Carmina Burana with Fairbanks Symphony (AK), Haydn’s Creation with Harvard University Choirs, Bach’s St. Matthew Passion with Masterworks Chorale, Mendelssohn’s Elijah with Nashoba Valley Chorale, and Handel’s Messiah with Rhode Island Philharmonic. This season includes Mozart’s Requiem with Brown University Chorus, Brahms’ Requiem with Harvard-Radcliffe Collegium Musicum, Haydn’s Paukenmesse with Nashoba Valley Chorale, orchestrated Strauss songs with Wheeling Symphony Orchestra, and song recitals in Vermont, Connecticut, Providence and Washington, DC. Hailed by Classical Voice of New England as “thoroughly delightful” and a “consummate storyteller, musician and artist,” Emily Jaworski is earning a reputation for excellence and constantly surprising audiences with her versatility. From the oratorios of Bach to the art songs of Brahms and Copland, to jazz, pop and musical theatre; on the opera stage or in professional ensembles, Emily is committed to forging a deep emotional connection with every piece she sings. In recent seasons, Ms. Jaworski has been honored to debut mezzo-soprano solos in three world premieres by Jonathan Santore – Solstices (2014), Battle-Pieces (2015) and Requiem: Learning to Fall (2016), the performance of which is now available on There Are Many Other Legends, a compilation of Santore’s works released by Navona Records. In the fall of 2016, Emily collaborated with colleagues in multiple disciplines to co-create Brilliant Being, which combined improvised dance and vocal music with interactive projections and new electronic music by Santore. Recent opera roles include Carmen with Longwood Opera, Lola in Cavalleria Rusticana with the Pioneer Valley Symphony, and the Old Lady in Candide with the Manchester Choral Society. Other recent appearances include Bach’s Magnificat and Mass in B Minor, the Durufle Requiem, Handel’s Messiah and Dixit Dominus and the Dvořak Stabat Mater; Sharon in Master Class and Abby in The Musical of Musicals! The Musical; as Italian Renaissance poet Gaspara Stampa in the New England premiere of John Ratledge’s cantata The Divine Siren, and on the recital stage in venues throughout New Hampshire and Boston. She is a member of the New Hampshire Master Chorale and the chamber choir Voices 21c. Ms. Jaworski’s love of research, dedication to musical details and commitment to text have led to honors from the Joy in Singing Foundation, the Friday Morning Music Club, and the American Traditions Competion. 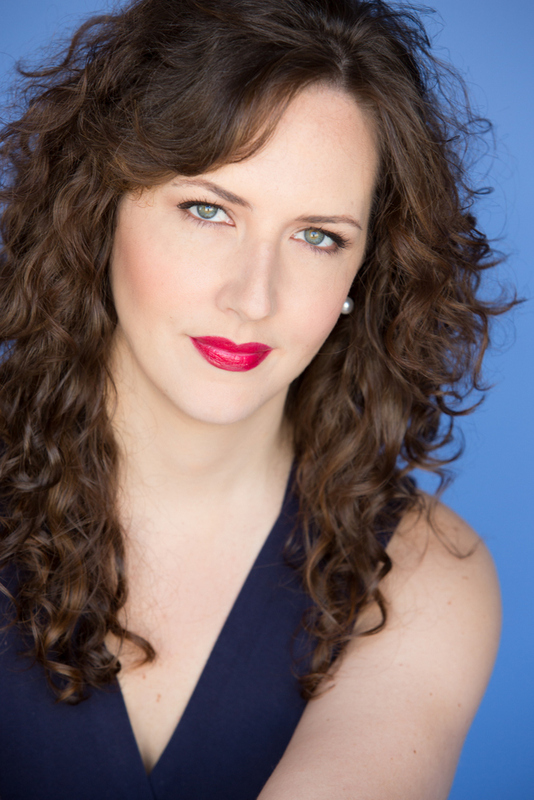 Emily is a two-time participant in Ann Baltz’s groundbreaking OperaWorks training program and has also participated in the Bassi Brugnatelli Singing and Conducting Symposium in Robbiate, Italy, Bay View Music Festival, Opera Academy of California, and New York Opera Studio. She holds a Master of Music degree from Boston University, and a Bachelor of Arts in Music from Susquehanna University, and is currently pursuing her doctorate at Boston University in the studio of Dr. Lynn Eustis. Ms. Jaworski is a frequent adjudicator, masterclass teacher and clinician, and has presented at Susquehanna University, Keene State College, The All New England Choral Festival, Connecticut Music Educators’ Association, and the Unitarian Universalist Musicians’ Network. In the summer of 2015, she was a teaching artist at the Härnosänds Summer Opera Festival in Sweden. Emily maintains a full voice studio at Plymouth State University in New Hampshire. 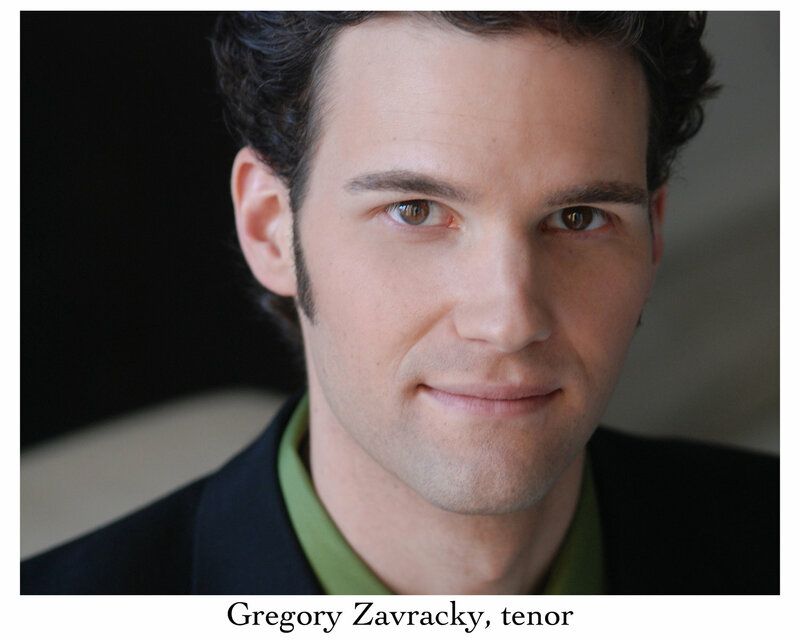 Praised for his fine musicality, “glowing intensity,” and “clarion tone,” Gregory Zavracky maintains an active performance schedule on concert and opera stages alike. Recent engagements include the Officer in The Barber of Seville with Boston Lyric Opera, Count Almaviva in The Barber of Seville with Townsend Opera, Tamino in Boston Lyric Opera’s family production of The Magic Flute, Gherardo in Gianni Schicchi and Buoso’s Ghost with Lake George Opera, Ferrando in Così Fan Tutte and Camille in The Merry Widow with Cape Cod Opera, Ernesto in Don Pasquale with Opera in the Heights in Houston, Lechmere in Owen Wingrave with Boston University Opera Institute, Don Ottavio in Don Giovanni with Metrowest Opera, Face on the Barroom Floor with Charleston Chamber Opera, Don Ramiro in La Cenerentola with Capitol Heights Lyric Opera, and Prince Dauntless in Once Upon a Mattress and Schmidt in Werther with Chautauqua Opera, where he also covered Nemorino in the Elixir of Love. Festival, David Wolfson’s Faith Operas with Hartford Opera Theater, Steven Sametz’s A Child’s Requiem with the University of Connecticut Orchestra, Ketty Nez’s The Fiddler and the Old Woman of Rumelia with the Xanthos Ensemble and James Yannatos’ Rocket’s Red Blare with Intermezzo Opera, and Three American Songs by Anthony DeRitis (soon to be released on CD). A 2009 Gerda Lissner Foundation Encouragement Award recipient, a 2010 Liederkranz Competition finalist in the art song divison, and a 2011 finalist in the Connecticut Opera Guild Competition, Gregory’s concert experience includes opera and pops concerts with both the Chautauqua and Utah Symphony, Handel’s Messiah with the Rhode Island Philharmonic, Haydn’s Lord Nelson Mass and Mozart’s Vespers with the Providence Singers, Schubert’s Mass in G with Coro Allegro; Britten’s Les Illuminations with the Aurea Ensemble; the Bach Magnificat and Cantata 191 with Back Bay Chorale, Janácek’s Otcenás and Respighi’s Lauda per la Natività with Chorus Pro Musica, Carmina Burana with Masterworks Chorale; Mendelssohn’s Elijah and Haydn’s Creation with Nashoba Valley Chorale; Mozart’s Mass in C minor with Quincy Choral Society, and Bach’s B Minor Mass with the Connecticut Virtuosi. Gregory received his Doctorate of Musical Arts from Boston University. Previous degrees include a Bachelor of Arts in music from Emory University, followed by two Master of Music degrees from New England Conservatory in voice performance and opera studies as a student of Edward Zambara. He currently teaches voice at the University of Connecticut, Brown University, Eastern Connecticut State University, and Boston University Tanglewood Institute. Highly praised for his “rich voice and comic timing” (St. Louis Post Dispatch), Andy Papas has been well lauded in performances across the country. Born and raised in Boston, Andy makes his principal debut with Boston Lyric Opera in 2018 in The Threepenny Opera, and returns to Boston Opera Collaborative for La Bohème in April. He joined Opera Saratoga for their recent summer festival, covering the title role in Falstaff, singing Bugs/Gent in The Cradle Will Rock, and performing in 2017 Season Concerts. After Saratoga, he sang his fourth Magnifico, this time for Berks Opera’s production of La Cenerentola in Reading, PA. This fall he is in Seattle for Les Contes d’Hoffman with Pacific Northwest Opera. Andy made coast-to-coast debuts during 2015-16 season, broadening his growing crossover repertoire. With Fiddlehead Theater Company in December, Andy sang the hilariously flamboyant French gourmand Chef Louis in The Little Mermaid, where ArtsImpulse applauded his “unexpectedly brilliant performance [that] brought the crowd nearly to its feet. Andy was in Los Angeles in April ’16 in a comic double-bill of Mozart’s The Impresario and Salieri’s Prima la Musica e Poi le Parole with Pacific Opera Project, singing leading roles in each. In March 2016, he was the comically stuttering Hans Wagner in Evangeline – The Belle of Acadia, with The Longfellow Chorus of Portland, Maine. For Winter 2016, he recorded the role of President Nixon in Roger Rudenstein’s Faustus, and sang The Herald in Verdi’s Otello with the Boston Youth Symphony Orchestra. Andy spent the 2014-15 season singing the evil stepfather Don Magnifico in La Cenerentola from Coast to Coast, with performances in Seattle, Milwaukee, and Maine. After singing Magnifico for Skylight Music Theatre in September, he followed up with his west coast debut as Magnifico for Skagit Opera of Seattle in March, and in July for The Bar Harbor Music Festival. In April 2015, he added to his list of World Premieres, performing Stephano in Joseph Summers’ The Tempest, with The Shakespeare Concerts of Boston. Andy made his debut under the baton of Gil Role as Peter Simple in Vaughn-Williams’ Falstaff tale, Sir John in Love, with Odyssey Opera in May. He returned to the Pacific Northwest in early June for the iconic baritone solo in Beethoven’s 9th Symphonyfor The Mid-Columbia Symphony. Finally, he was in St. Louis in August for a third season with Union Avenue Opera, performing Count Ceprano in Rigoletto. In 2013-14, Andy expanded his New England footprint in his first performance in Vermont. With The Opera Company of Middlebury, Andy was Haly in L’Italiana in Algeri, where The Rutland Heraldlauded his “rich voice” and called his performance “a riot”. With The Reagle Music Theatre of Boston, Andy made his professional Musical Theatre debut as Avram in Fiddler on the Roof. Late in 2014, he performed his signature Gilbert & Sullivan roles, The Major General in The Pirates of Penzance and Ko-Ko in The Mikado, both for Opera Providence. Additionally, he toured throughout the Great Lakes as Dr. Bartolo in The Barber of Seville with Opera for the Young. 2012-2013 included performances in both the Midwest and New England. Andy was the Tsar in the world premiere of Polina Nazaykinskaya’s The Magic Mirror with Juventas New Music Ensemble and also for The New York Fringe Festival. In 2012, in his hometown debut, Andy was Schaunard in La Bohème with Boston Opera Collaborative. In February 2013, Andy sang a concert of Opera and Musical Theater favorites as part of the Indianapolis Hebrew Congregation’s Concert Series. Prior to that, he performed the role of the Father (Pandolfe) in Cinderella (Cendrillon) with Opera for the Young. With Cinderella, Andy toured to 65 schools in four states in the debut season of the show. In November 2012, Andy charmed New Hampshire audiences as Ko-Ko in The Mikado with Raylynmor Opera. Also in November, Andy returned to St. Louis to perform in the 2012 Benefit Gala with Union Avenue Opera. He was last seen at Union Avenue Opera in 2011 in the role of Pong in Turandot, under the baton of Maestro Scott Schoonover. Praised by the St. Louis press for a delightfully comedic performance, Andy also sang with Union Avenue as the Major General in The Pirates of Penzance in 2010. In the spring of 2011, Andy joined Opera for the Young as both the Major General & The Pirate King in The Pirates of Penzance, touring to over 50 venues throughout the Midwest. Opera for the Young is a unique opera company that incorporates children into the performance at each school. The cast of Opera for the Young teaches a new group of children at each school to be the onstage chorus, encouraging appreciation for opera in a truly hands-on approach. Andy also performed both the Father & Witch in OFY’s original adaptation of Humperdinck’s Hansel & Gretel in 2012. Andy was a 2011 Emerging Artist with the St. Petersburg Opera, performing Marullo in Rigoletto, Schaunard in scenes from La Bohème, and Uncle Yakusíde in Madama Butterfly. Additionally, he covered the role of Sharpless in Madama Butterfly and performed the role in several performances throughout the Tampa Bay Area. While at SPO, Andy coached with acclaimed Soprano Stella Zambalis, and Maestro Mark Sforzini. In the summer of 2009, Andy was a young artist at Opera New Jersey, covering the role of Ko-Ko in The Mikado. He was seen in concerts throughout Princeton, NJ, performing opera and musical theater scenes as well as his original rendition of “I’ve got a little list”. Andy completed his Master of Music degree in Voice Performance at the University of Houston in 2009. While at UH, Andy was seen as Uncle John in the Houston premiere of Ricky Ian Gordon’s The Grapes of Wrath, Le Mari in Les Mamelles de Tiresias, Jupiter in Orpheus in the Underworld and Snooks Brenner (Father of the Bride) in William Bolcom’s A Wedding, all under the direction of Buck Ross. In Houston, he was also seen as the title role in Gianni Schicchi, as soloist with the Houston Ballet II, and in outreach performances of The Refuge with Houston Grand Opera. In addition, Andy collaborated with celebrated musicologist Howard Pollack, singing Junior Mister in Marc Blitzstein’s The Cradle will Rock. 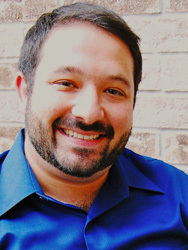 Prior to attending UH, Andy made his professional debut as an Apprentice Artist with Lyric Opera Cleveland in 2006. He performed the role of Redwood Son in the World Premiere of Randall Eng’s Florida, and Samuel in The Pirates of Penzance. Andy received his Bachelor of Music in Voice Performance from the University of Michigan in 2007, performing in both Musical Theater and Opera. Musical Theater role credits at UM include Charlemagne (Pippin), Old Man Strong (Urinetown), and Smokey (Damn Yankees). He studied with Freda Herseth, and coached with acclaimed composer & performer duo William Bolcom and Joan Morris. Andy was born and raised in the Boston area, and started playing both piano and trumpet at the age of 8. He performed leading roles in musicals and plays, and was Drum Major of the Winchester HS Marching Band. In his free time, Andy enjoys skiing, traveling, and the foodie life, and owes thanks to his family, friends, and partner Chris for their love and support.